To finish up the month of May, the Month of Mothers (hey, we changed a lot of diapers; we deserve more than just one day of recognition! 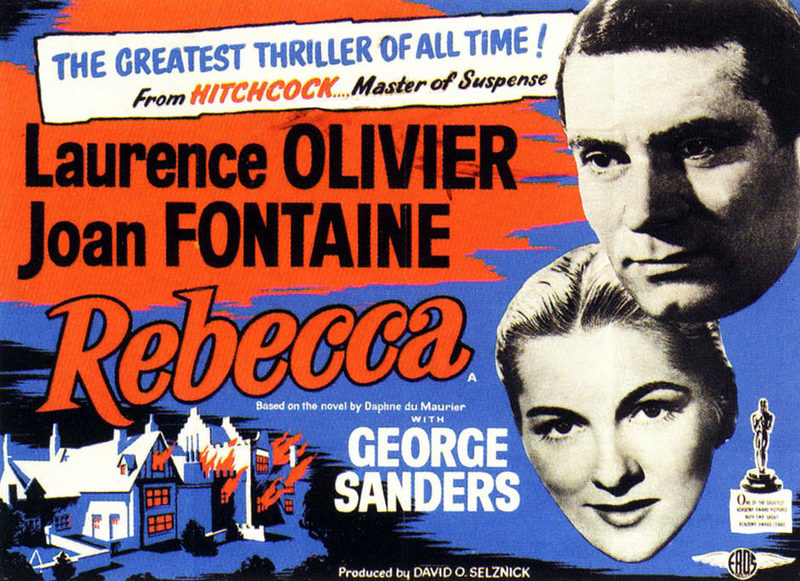 ), we’re delighted to feature a guest post analyzing the role of Mrs. Danvers in the 1940 film version of Rebecca, directed by Alfred Hitchcock. Over the years, some critics have attributed Danvers’ attachment to Rebecca to be one of repressed sexual longing for her alluring young employer. Here, Janice Alves takes a different approach, examining how the relationship between Danvers and Rebecca could be construed more maternally. Many words come to mind when I think of the word “mother.” Loving, loyal, dedicated, caring, protector, and compassionate are just a few. 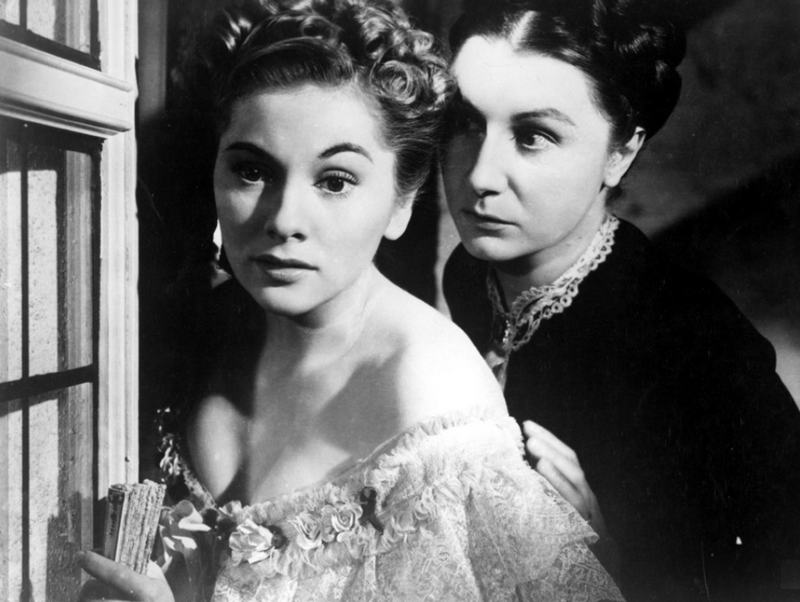 And while these are not exactly the kind of words that come to mind when considering Mrs. Danvers (Judith Anderson) in Rebecca, in some ways, they do express the way that Mrs. Danvers fondly recalls her late mistress. Could it be that Danvers felt that she was, in a sense, Rebecca’s mother? As I watch the movie, I can’t help but feel that there is something very creepy about Mrs. Danvers (Danny, as she was known to Rebecca). The way she talks, walks, dresses, and looks is not what I think about when I reflect about a mom. When I was a child, I would have been afraid of Mrs. Danvers. But Danny’s spoken words remind me of a mom talking about her child. When Danny reminisces about Rebecca, her voice softens. There is love in her voice, and it is obvious that she was, and still remains, proud of Rebecca. She knows all of the late Rebecca’s secrets and thoughts, including the bad, but she never reveals that bad side to anyone–nor does she ever seem to acknowledge it to herself. It’s as if she was a best friend to Rebecca, but with the age difference, it is more likely they could have shared a mother-daughter type of relationship. Rebecca was a child who never grew up, and Danny allowed her to remain somewhat childlike as she tended to her every need and whim. Danny’s life revolved around Rebecca, and even in death, she is unable to let her go and rest in peace. It is as if she has lost her only child and is therefore lost without her. Rebecca is described as having been a beautiful, clever, and adventurous woman, but according to her husband, Max DeWinter (Laurence Olivier), she was actually manipulative, hateful, immoral, and evil. But, as a mother, Danny is not going to disclose these bad traits to anyone. She will only speak of the good things. These traits are hidden and disclosed to no one because a mother is devoted to her child. Danvers will forever deny the more sinister aspects of her beloved Rebecca’s personality; no one will stain Rebecca’s reputation on Danny’s watch. Danny is unable to welcome the “new Mrs. DeWinter” (Joan Fontaine) into Mandereley. It’s as if she’s afraid that Rebecca’s memory will be lost or her true character will be revealed. She wants Rebecca back so badly that she is unable to face reality and let her go. She’s afraid and alone. Every chance she gets, Rebecca’s name is entered into the conversation. It’s as if she is mourning a child and all she can do is cling to the past. Deep down, Danny had to have felt some kind of disappointment for Rebecca. She knew that her adventures were not conducive to a marriage, but that didn’t matter, as long as she was able to care for her like a mother cares for a child and reassure her that everything would work out in the end. When she finds out that Rebecca withheld a secret from her, this hurt her beyond the grief that she felt about Rebecca’s death. A mother’s love is strong and powerful. It is unlike any other love. But could it overcome this betrayal? I believe that this grief is what made Danny burn down Manderley. Rebecca betrayed her, and she could no longer go on, but she had to protect her, even in death. The only thing she could do was to get rid of everything that was associated with Mandereley, and she would hold onto the memories that brought her happiness and joy, even if it meant her own destruction. Because Danvers was, for all intents and purposes, Rebecca’s mother, and only mothers understand their children. Janice Alves is a college math instructor by day and classic movie fan by night. As a mother of four children, she is well acquainted with the demands of motherhood. ← Athanael, come blow your horn. 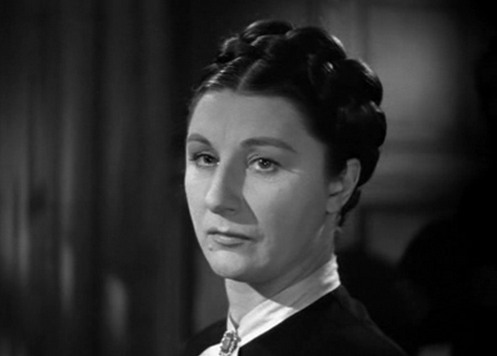 I haven’t read the book, but I think I did read that in said book, Mrs. Danvers is her governess. This perspective makes sense based on the book.